In August 1999, the Whalers Retreat in Hyams Beach received its first guests. Over the next 16 years many people have visited Hyams Beach and holidayed in an area that is very dear to our hearts and in our house that we love to share. The Retreat is within easy walking distance from 3 beaches and has views over the bay to Point Perpendicular from both levels. So grab a towel and wander to the white beaches or have a BBQ on the verandah, taking in the panoramic bay views and you may even glimpse the dolphins and whales at play. Children are welcome. Unfortunately, pets are not allowed and smoking is only permitted on the verandah. 57-59 Cyrus Street, Hyams Beach, New South Wales. "The pictures in the magazine and brochure lived up to their expectations. It was beautiful bay side cottage in a picturesque setting. Thank you for all your attention to detail and excellent local advice." "We have been happy holiday house renters for 30 years and this is the nicest house we have ever stayed in." "We had such a lovely stay at Whalers Retreat. The place is in such close proximity to the beach and love that there’s an outdoor patio, balcony and rooms that overlook the water of Hyams Beach. Such a gorgeous place and looking forward to staying here again." "To complete the nautical experience, Whalers Retreat at Hyams Beach is the perfect place to stay. Built in the same style as the old-whalers' cottages that once occupied parts of the far south coast, the accommodation is totally relaxing." "Beautiful beach house – cosy fire and well equipped kitchen! Whalers Retreat is a very special place. It is designed with great taste and for ease of living. Trusting guests with your charming knick knacks is a sign of great class. Hyams is magic and so much to explore." "Had such a fabulous stay at the Whalers Retreat! Everything was absolutely wonderful. A perfect place to have a holiday. We are so sad to be leaving. We will be seeing you soon Whalers Retreat!" "All too soon our week at Whalers Retreat is coming to an end. From the moment we stepped inside we felt the homely atmosphere and knew that this was going to be a relaxing place to stay. The house is well equipped, well furnished and comfortable with beautiful views especially from the open bedroom door in the morning. Quite simply it was a perfect base from which to explore the stunning surrounds that Jervis Bay has to offer." 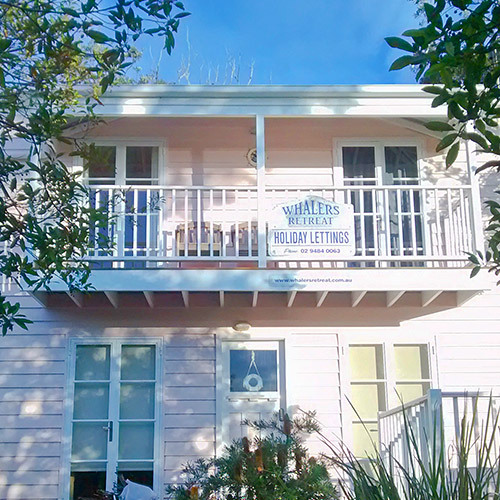 "Whalers Retreat, a pink two-storey house minutes from the beach, is just the ticket. Whalers Retreat is a comfortable and well-equipped seaside pad that will suit two couples travelling together or perhaps a family with small children." "We had a lovely stay in this beautiful home and location! The house is a perfect retreat and wonderfully furnished and equipped. We loved all the decorative touches too! The white sand and beautiful water was enjoyed by all."